Living room opening onto veranda with wooden dining table and chairs. Also has a kitchen and guest washroom.3 air conditioned bedrooms: 1 double bedroom and 2 twin bedroom, both with en suite bathrooms, plus 2nd double bedroom with en suite bathroom and jacuzzi bath.Private pool, sun terrace, barbecue. The kitchen features: granite work-tops, full oven, cooking hob, fridge/freezer, microwave, dishwasher, washing machine and kettle. There is also a Barbecue. 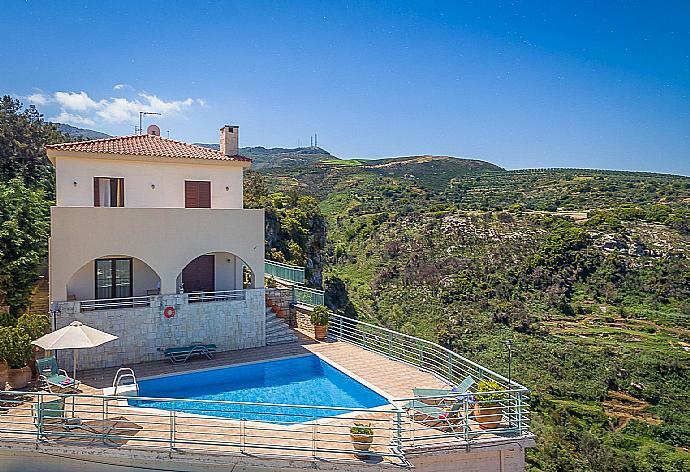 Villa Selini can sleep up to 6 people. Villa Selini has a fantastic sun terrace with spacious swimming pool, with breathtaking views over Rethymnon and the Cretan Sea, in a location that provides outmost tranquility and privacy. Vue imprenable sur la mer, maison trÃ¨s confortable pour 6 adultes grÃ¢ce aux 3 chambres avec salle-de-bain chacune. Personnel trÃ¨s sympathique. Si nous revenons en CrÃ¨te nous choisirons la mÃªme maison. Amazing view of the sea, very comfortable house for 6 adults thanks to 3 bedrooms with bathroom each. Very friendly staff. If we come back to Crete we will choose the same house. Overall a fantastic stay. Maria and her colleague kept the villa spotless and we have loved our stay and would definitely come back. The pool was constantly kept to a high standard, the gardens were maintained beautifully and the cleaning of the villa was to a high standard. When a shower head broke it was replaced within 5 minutes! Superb. It was a wonderful location and a perfect setting for our family holiday. The facilities and service was first class and the villa was even better than expected. 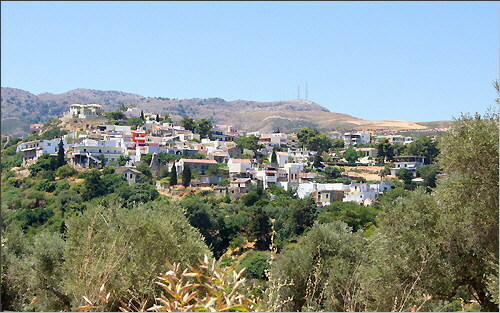 The village of Roussospiti was very friendly with the little mini-market and wonderful Mylonas taverna. We will be returning next year! Thank you. We had a very good holiday at this fine property. We had a fabulous week at Villa Selini. 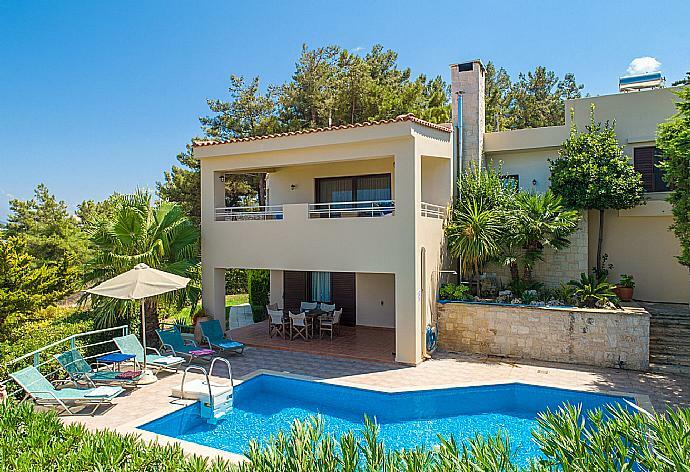 A well furnished and well resourced villa. The views over Rethymnon are stunning. It was a pleasure to stay in such a friendly village. We had a small problem with the toilet plumbing in one of the en suite bathrooms. This was fixed very timelessly and didn't impact on our holiday. We would also like to mention the outstanding service from Maria. She was very helpful in contact with us by email and in person and invited us to the village feast day celebrations. We felt very welcome. Overall we had a very relaxing holiday at Villa Selini, we thought the villa was comfortable. We had no maintenance problems during our stay and as mentioned above the villa was spotless and the local cleaner did an excellent job cleaning and changing the linen etc frequently during our stay. In particular we would like to thank and commend your local agent Maria - she was very welcoming helpful and friendly and put great effort into ensuring we were informed about the island and places to visit etc. Also we found the whole process and experience of booking accommodation with AGNI Travel very straightforward and we would definitely contact AGNI Travel again if required in the future. Splendid we were 100% satisfied. We enjoyed our stay in Crete and would use Agni Travel again. In fact Agni Travels service made us feel very comfortable. Thank you. We went on holiday with our two daughters and had a great time in a splendid villa on an amazing island. Based on previous driving experiences on Greek islands I was dreading this aspect but it was fine - generally decent roads and very little traffic out of the towns. There are 2 tavernas in the village of Roussospiti. We had fabulous food in Taverna Bambakis and he has very decent white wine. He was charming and his food was just fab, we really want to recommend him to other visitors. We went on holiday with our two young adult daughters and had a great time in a splendid villa on an amazing island. Based on previous driving experiences on Greek islands I was dreading this aspect but it was fine - generally decent roads and very little traffic out of the towns. There are 2 Tavernas in the village of Roussospiti. One is on the road through the village so is very obvious and seemed to have lots of customers. The other is actually closer to Selini but up a little hill so not so obvious - Taverna Bambakis - a couple of letters are different in Greek. But we had fabulous food there - all the salad and vegetables come fresh from his garden and he has very decent white wine - 6 euros a litre (he also has Retsina and red). He was charming and his food was just fab and big portions and we really want to recommend him to other visitors. The property was beautiful and even better than the website description. The best part of the holiday was the service received from Agni Travel. I really appreciated your quick responses to queries and your contact during our stay to ask if we needed anything as well as the local area guide which was very useful. Special thanks to Maria, it was lovely to meet you and thank you for all your help. The villa was perfect for our stay it is very well equipped was spotlessly clean and has all the home comforts (dishwasher, washing machine, good water pressure, no shortage of hot water) which you sometimes miss in self-catering accommodation. When driving to the villa we found it easier to drive into Rethymno and turn left at the Biotza Furniture shop and sneaker shop which is shown on the map as Epar Od. Rethimnou - Roussospitou. Once you reach the top turn right one road before the Luxury Crete Villa Sign follow this road all the way up and the villa is on your right.The Mylonas Taverna in Roussospiti is excellent. I recommend the drive to the Domnoni or Plakias on the south of the island for some stunning mountain scenery. One of our best holidays ever. We were really impressed with the villa and service of Agni Travel. Rethymnon is beautiful and would highly recommend anyone to use Agni Travel and the villa if visiting. Will hopefully be back next year. Everything far exceeded our expectations. Service from Agni Travel was by far the best service we have received on a holiday. From the initial booking to the actual holiday they were extremely helpful and informative at all times. The house was excellent and the maid was excellent. Crete is a wonderful Island. We would like to come back! The location of this villa is really spectacular with amazing views and as it is on the edge of the village it feels more private. But it is also within easy reach of the facilities in the village. The pool is excellent and located in such a way that you can enjoy the sun all day. The facilities in the villa were exactly what we needed to cook a few meals and prepare picnics. A very memorable holiday. Excellent (but too short). We would love to visit in the future. Thanks so much. If anything the villa is even nicer than the pictures on the website. It is wonderful. Generally a very enjoyable holiday, unfortunately some unseasonably wet weather slightly reduced it from excellent. The villa site means that you have magnificent views. Swallows fly over the villa and drink from the pool which is lovely to see. There are also birds of prey nesting in the gorge. You are not overlooked at all. Villa Selini was booked 3 days ago!